Our July newsletter features new research by DCO scientists across the life, space, and Earth sciences. 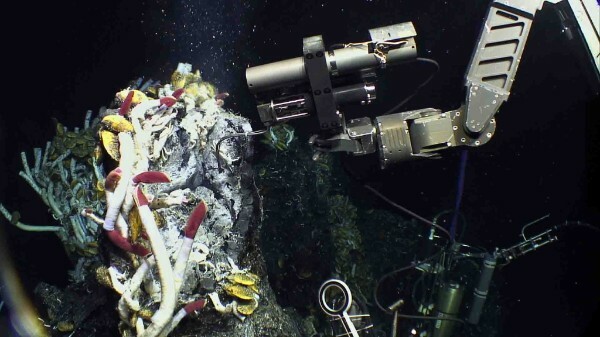 In a paper in the Proceedings of the National Academy of Sciences, Jesse McNichol (University of Southern California, USA), Stefan Sievert (Woods Hole Oceanographic Institution, USA), Jeffrey Seewald (WHOI, USA), and colleagues estimate the global production of organic carbon by microbes living below the seafloor at deep-sea hot springs. Their data reveal a very active subseafloor biosphere that significantly influences global biogeochemical cycling. Chris Glein (Southwest Research Institute, USA) and an international team of researchers published a paper in Nature reporting the discovery of complex carbon compounds emanating from the ice covered ocean on Saturn’s moon Enceladus. This finding suggests the moon's oceans contain the raw ingredients necessary for life. Jodie Pall, Sabin Zahirovic, Sebastiano Doss, and Dietmar Müller (University of Sydney, Australia), and colleagues demonstrate that interactions between carbonate platforms and subduction zone volcanism have influenced the concentration of carbon dioxide in the atmosphere, as well as global climate, on geologic time scales during the past 410 million years. DCO scientists have also been recognized this month. Congratulations to Tamsin Mather (University of Oxford, UK), who won the 2018 Royal Society Rosalind Franklin Award and Lecture, to Antje Boetius (Alfred Wegener Institute for Polar and Marine Research, Germany) who received the 2018 Communicators Award conferred by the Deutsche Forschungsgemeinschaft German Research Foundation and the Stifterverband, and to Claire Cousins (University of St Andrews, UK), who was elected to the Royal Society of Edinburgh Young Academy of Scotland. We encourage you to submit abstracts to sessions of interest to the DCO community at the 2018 AGU Fall Meeting in Washington, DC, USA. The abstract deadline is 1 August 2018. And lastly, more than 100 DCO scientists will present their research at Goldschmidt 2018 on 12–18 August 2018 in Boston, USA, including many session conveners and keynote speakers. We will report on this meeting next month. The 2018 AGU Fall Meeting will take place from 10-14 December 2018 in Washington, DC, USA. In the final webinar of this series, Anirudh Prahbu (Rennselear Polytechnic Institute, USA) will demonstrate real-world “geoscience use cases,” helping participants solve scientific problems using data/model-driven decision-making. The International Mineralogical Association is an umbrella organization uniting professional associations from 38 countries, and its quadrennial meeting is the largest global forum for making contacts and exchanging information with mineral scientists from around the globe. The conference is a joint outreach meeting between three European networks; CarbFix, S4CE and MetalAId, and the Deep Carbon Observatory and CarbonSafe, and includes the DCO workshop, "Catastrophic Perturbations to Earth’s Carbon Cycle" from 10-11 September. Extremophiles2018 aims to show the updated state-of-the-art of research on basic and applied aspects of life in extreme environments and to stimulate high quality research, inspiring those already working in the field and young scientists interested in studying extremophiles. The purpose of the school is to train students in the detection, monitoring, and modeling of convective and volcanic clouds, including utilizing a variety of techniques, instruments, and satellite data. Participants from around the world will discuss the origin and biogeochemistry of methane, new discoveries regarding methane metabolism, recent research concerning methane flux from terrestrial and marine environments, and newly discovered methanotrophic and methanogenic microorganisms and their role in methane cycling. The meeting will serve as a platform where participants exchange ideas on progress in deep exploration of the lithosphere, to better understand deep processes in Earth, expand the new knowledge into practical applications, consider the future, and promote international collaboration on deep exploration of Earth. Registration now open.